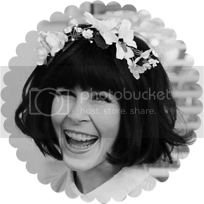 This giveaway is kindly sponsored by Ashbury Skies, an independent San Francisco-based online shoe store stocking a hand picked range of designers such as Dolce Vita, Madison Harding, Haus of Price and Jeffrey Campbell. When visiting their website I noticed it looks very professional and is easy to navigate, with each product page including useful information such as heel height, fit of shoe, materials and size chart, plus a quote from the shoe's designer about the style. After some deliberation over which shoes to purchase, I settled on the Madison Harding 'Rita' ankle boots as a) I could probably walk in them without too much trouble, and b) they look quite versatile. I'm usually size AUS/US 7.5 in shoes, which can make it tricky when they don't come in half sizes. The Ashbury Skies site suggests that this shoes runs true to size so as I like to wear socks and tights a lot I purchased a size 8. Checking out was very straight forward and there is the option to send your order to different addresses is needed, which is useful if you want to do a split order with friends. I could choose from regular shipping via USPS (4-10 working days) or priority shipping via Federal Express (1-4 business days). As I didn't need the shoes in a rush I chose free regular mail by using the code 'freeship11', which saved me $38.00 in postage. On the next page the payment methods to choose from were PayPal or credit card, and I received a confirmation email immediately after completing checkout. I was very pleased when I received an email the following afternoon with a tracking number notifying me that my order had been shipped already. I received my order five days after it was posted and was required to sign for it. It arrived safely in a sturdy cardboard box sealed with Ashbury Skies tape. Inside the shoes were well wrapped and stuffed so that they were protected and kept their shape during transit. An invoice was also enclosed in a bright orange envelope, which added a nice touch as it tied in very nicely with the colours of the website. 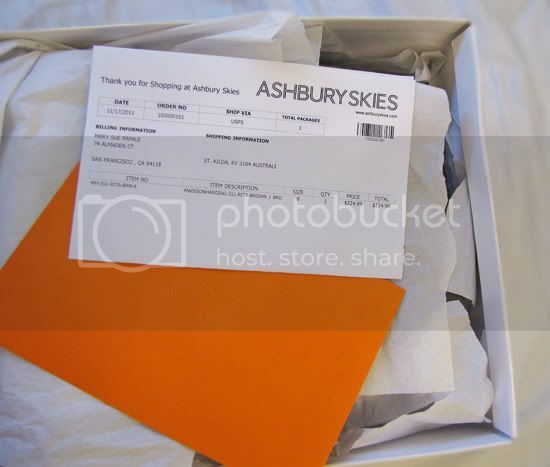 The first thing I noticed when taking the boots out of the box was that they were quite a lot darker than in the photographs on the Ashbury Skies website. 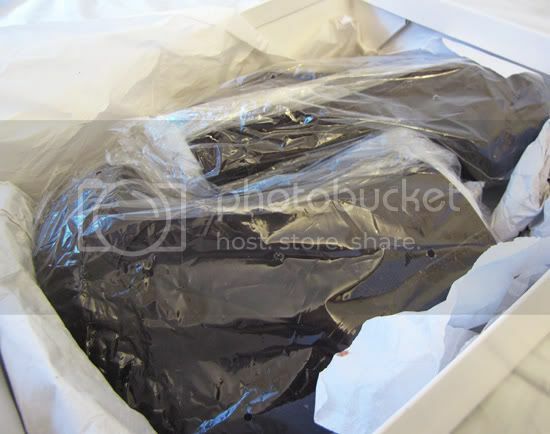 The boots are a dark chocolate brown in person, while in the stock photos they look more like a medium chestnut brown, as you can see below. The Madison Harding boots are gorgeous in person and look well-made. The suede is very soft, they fit true to size, and are actually very easy to walk in! 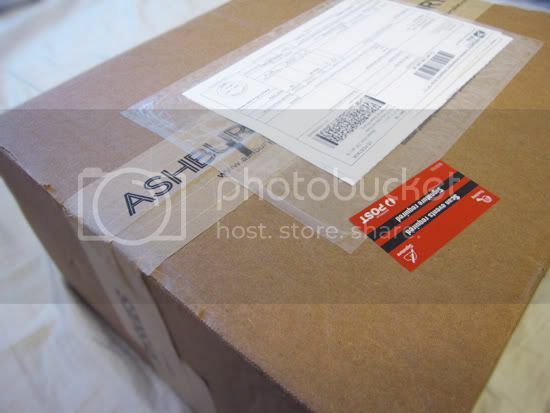 All in all, my shopping experience with Ashbury Skies was a very positive one and I'd definitely be happy to order from them again. If you have any questions, please leave a comment on this post and I'll get back to you very soon. The process seems very professional and the boots look great but that colour is way off the actual item. I'd be very disappointed with that. However the darker brown is still a nice colour. those boots are cute! but the colour difference is inexcusable, its like they aren't even the same thing! Wow the shoes looks great, but yeah the color is the problem, way off than the actual photos, don't you ask them why? I agree that the dark brown is still a nice colour, but ridiculously far off from the stock photo - that's a bit of a worry I think. wow, that is a huge difference in colour. Nice review! those are really great in either colour! are you sure you didn't just receive the wrong colour though? it seems like such a big difference! I'd be upset if I ordered these shoes and the color was completely off! If someone is trying to buy a chestnut colored shoe a dark brown doesn't do much good. They are a great looking shoe, they just need to depict it accurately. i would be pissed if i got shoes that were not even close to the colour advertised. especially at that price. i would complain. Another Pro: Ashbury Skies is like, da sweetest name eva! Loaf it!